Designed as a white cube, the Studio provides adequate scope for creative event concepts. 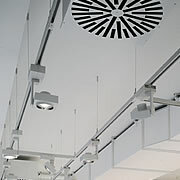 A ceiling-mounted grid lighting system and LED lights concealed in the coving offer additional flexibility when presenting a brand and the room itself. The Studio is perfect for events such as conferences, receptions, dinners, corporate, brand or product presentations, incentives and exhibitions. . The Studio’s reinforced floor allows heavy exhibition pieces (e.g. motor vehicles or sculptures) to be placed safely. 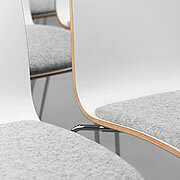 The high quality conference furniture and reception counter can be arranged in a wide variety of different ways. For larger events, the adjacent Salon can be used as a preparation or reception area or as a discreet spot for private discussions. The furnishings, which comprise elegant conference seating, a technically equipped speaker’s lectern and a mobile reception counter, can be arranged flexibly: from row seating for a conference, or a banqueting layout, through to round table set-up. The ERCO grid lighting system is operated with modern controls. As a modular system, it can be upgraded or downgraded to suit individual events. The audio system provides background music and short addresses of a high acoustic quality. All media at the Berliner Freiheit are managed by a central control system. The mobile reception counter in the Berliner Freiheit Studio is perfectly designed for flexible entrance solutions. 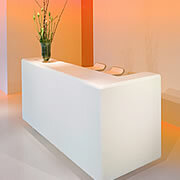 The integrated lighting and media connections transform this counter into a piece of superior reception furniture with which, for example, guest lists can be updated via Internet at the last minute. 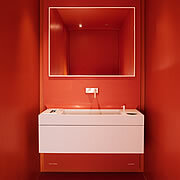 In contrast to the neutral white of the Studio, the architects have used a broader palette in the sanitary facilities. Finishings and design are of the highest standard, while the striking colours polarise in the best sense of the word. In the Salon, this room’s warm colours also extend to its separate sanitary facilities. 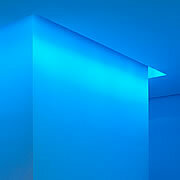 The Studio entrance area can be indirectly lit in practically any shade of colour or corporate design. It is also possible to programme colour sequences. The indirect illumination serves to light the way, or can be used as an event identifier.